is my husband, in a previous life he used to enjoy chess games that took more than 4 hours. The short fast games could not hold any appeal. These days he doesn’t have much time for chess, unless it’s on the IPad in the evenings as a form of relaxation. My Thinker has built a wonderful apiary for the native bees in my care that we of Noordbijbees are attempting to protect. In this country the Dark Native Bee has been maligned for many many years because she was not greatly productive for those who make honey harvesting/marketing one of their mainstays of being beekeepers. This terrain we have bought will eventually become a haven for these bees. We hope to provide sufficient amounts of forage for them and all other pollinators that they will not need to fly too far away in search of food and thus encounter and be endangered by pesticides and gmo crops. At the far end of the barn there was a place with a cement floor, it had a roof which continued from the barn itself but it is quite open at the front and side. There is also a sink with no tap (as yet). After we decided that the roofless caravan would not be suitable for an apiary The Thinker suggested this area. I was delighted because it already had so many useful details, like a loo and cupboard space. Now though level supports had to be built for the einraumbeute bee hives to stand on. I brough one empty hive from the nature reserve so that he had a proper idea of the size he had to build. If the bees are as pleased as I am with this result then they will very very happy bees I can assure you. That bit of garden with the manure heap you can see is where I am working on now, it has been reduced by half already. In the front of the bee apiary I will plant buckthorn trees. These grow just high enough for the bees to fly safely over. Along the foundation wall and in the soil on the other side of the path I had planted lots of thyme and sedum in September. I added a few bulbs when they became available. This was my first tiny piece of garden here. Since yesterday 23 December there are primulas and peonies, as well as ajuga plants here. I wonder if they will be a match for the couch grass? Lectori Salutem, Especially now with only a couple of days to go until Christmas 2015 may I wish you all a joyful, bee happy and a plant happy 2016. 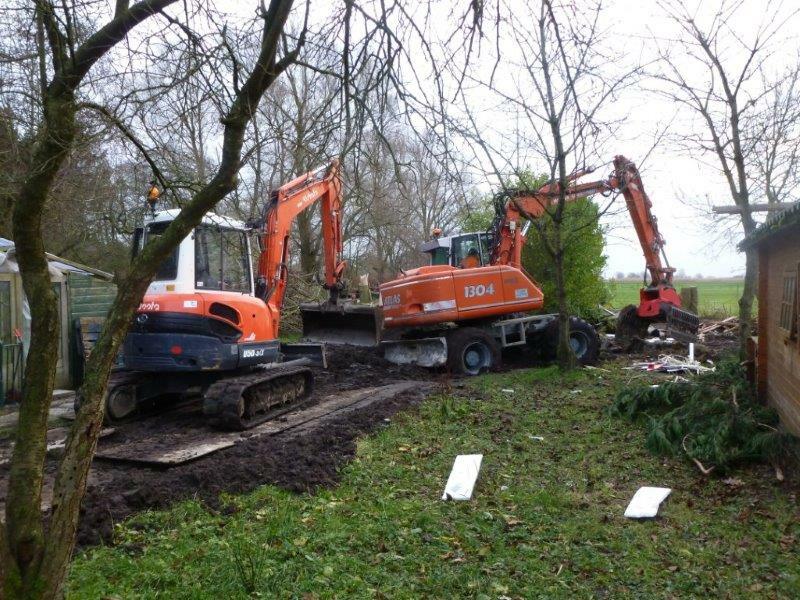 These lovely machines as shown in the photo have been very very busy in our garden at Wiggly Toe. The mobile home caravan with no roof was reduced to a pile of rubble in one day. You can see some of that in the picture. However, disaster struck when the big guy with tractor wheels got stuck in our sticky clay mud. The little Kubuto crane with caterpillar wheels was called in to help liberate 1304. The driver in the first crane tipped the front of his vehicle up leaning a great deal of weght onto his shovel arm, the other driver then shoved iron driving plates under the tipped wheels of 1304. Quite spectacular really especially when it is happening in your own back garden. Whilst most of that was going on I was busy planting my first garden. This little victory won from the grip of couch grass had been started on December 3rd. 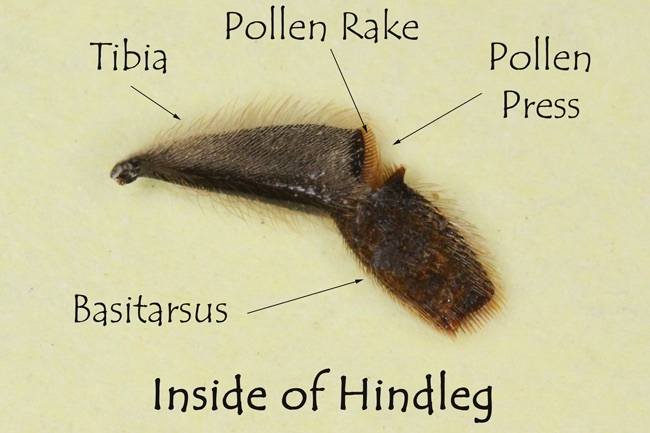 The couch grass covers most of our terrain and it is a plant that is very hard to eradicate, especially if you don’t want to poison the stuff….. I have dug trenches and rolled it up and removed it to dry up so that it can be taken to the Council composting location. I don’t think they will want it either but you are forbidden by law here to burn stuff in your own garden, at least that was what the neighbour, Willem said when we tried that solution, big €’s fine if the milieu helicopters flew over and nabbed us. So we stopped that cleaning method. Now I’m waiting for it to shrivel up and die but I think it has taken on a new lease on life and will start to grow again on the grids I placed it on to starve it of soil!! Nasty me…. After three days of clearing away and digging through the rock hard clay soil into which I incorporated lots and lots of the horse manure that we inherited with the property a better soil texture began to appear. My first two plants were the Virburnum Tinus bushes. I had bought one last March at the Biodynamic Beekeepers national day. This had been in a container at the nature reserve all summer. When I wanted to plant her into proper soil she seemed healthy enough to try a split. So doing the Gardner’s World trick with two forks I split the plant and then there were two!!! This bush provides vital foraging possibilites throughout autumn and is still in blossom throughout springtime. I had four tiny brem plants which had persevered through the pavement in front of my neighbours house, offspring from the bush in his garden. I asked him if he wanted them but he said I could pull them out if I wanted…. So they are planted now in one of the long sides. The peanut butter tree which I got as a thank you for the talk I gave to the nature club in April is planted there as well and along the backside I have a couple of hypericums and a couple of mahonias as well as snowberry’s which are also on the opposite long side near the greenhouse. Last Christmas Ruurd and I visited family in the south of England. I took advantage of being in that area to visit Sarah at Bee Happy Plants nursery in Chard. As the name implies Sarah is also completely oriented to the wellness of bees. It was here that we bought the plants meant for our future orchard. We also bought 8 Berberis Darwinii which I have now planted along the path of my first garden here in what I hope will become a haven for all pollinating insects, birds and bats. During one of the evenings of this digging week I was looking on the net for information regarding improving the texture of clay soil. This led me via via to a nursery man whose name is William de Bruijn. William and his brother own a bare root tree nursery. http://www.heestersindevollegrond.nl He had a YouTube film on his site which advocates not ploughing (turning over) the soil but cutting through it with a sharp knife so that small furrows develop in which you can plant without disturbing the soil structure and its inhabitants. I cannot do that as yet because my soil is compacted and thoroughly run through with creeping buttercup and couch grass so I have to be tough this year and hope that all the good soil buddies will forgive me and do their stuff so that this land will once again fulfill promise. Every earthworm I find under the rubble is carefully gathered up in wet hands and brought to where I hope it will make a new home. because the nursery is already having difficulty fulfilling demand from local ecologically minded town coumcils who want to plant it in a great many of their public garden spaces. So in my first bit of triumph over the couch grass there is a an innovative plant. I have planted them in an X. I took three roses from my garden here…. Duftwolke (Fragrant Cloud) and my Graham Thomas rose. One can sell a house but one cannot sell a garden is my philosophy. I would be devastated if the future new owners of our current house emptied the front and back gardens here and made them into a stone and buxus (box) stylish garden and they threw away all my loved plants and bushes. This house is not yet up for sale so I am depriving no one. It is such an arranged wilderness and bee and butterfly oasis. We even have salamanders in the back garden. But for people who like neat and tidy and cut grass lawns like estate agents, I still have to develop that look but there is plenty of time before we go on the market. In garden No. 1 I also planted my bluebells, tulips, daffodils, scyllas and crocusses all received with love on my birthday in November. I planted crocosmia Lucifer which I increase from its own seeds every year. I just love that colour red, a lot of hellebores too. I can’t wait for everything to start coming into flower. 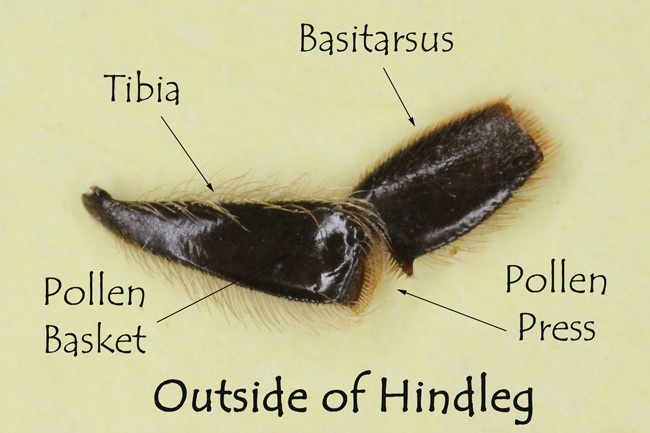 I am in a bit of a predicament because this site was started to talk about our experiences with our native bees and what sort of things happened with the bees during the different seasons. I find I am going to have to change it quite a bit for the time being. The bees will still come into my stories but the whole thing will encompass a great adventure. Ruurd, my partner in crime as well as other things and I are both 62, or I will be next month and he was last March. Eighteen months ago he went into a pre-pension situation. His colleagues thought that he and I would opt for a camper van and go off on all sorts of trips… That didn’t happen. Instead we followed a short sailing course together with one of our daughters and her friend. We took to sailing like ducks do to water…. We then bought a polyvalk in which we had great fun during our first sailing season. The lake we sail on is about 10 minutes from where I have two of my bee hive sites. The procedure was that I would drop Ruurd off at the harbour so that he could pursue his hobby and then I would drive go off and do my bee thing – very happy indeed. However I was never finished at the same time as he was …. so, in this case – I being the one with car keys and he being the one in a boat – it often turned out that I kept him waiting…. This problem has now been laid to rest because at the end of August we bought a meadow. Two other members of Noordbijbees, Johannes and Cor live next door to each other. The adjacent property to their homes, about 200 meters across a field was going to be auctioned due to bankruptcy. Ruurd and I went to that property auction. Lot No. 5 was the one we were interested in ….. and at the crucial moment my man called out that this one was for him…. You really do actually have to shout out loud “MINE!” Raising your hand and signalling is not considered a valid bid…. And so it came about. The bank had foreclosed on the previous owners who had been busy with hennep growing (cannabis) as well as having set their house on fire to acquire the insurance money….. The next day we went to really see what we had bought; my heart nearly stopped. It was an unbelieveable mess. Ruurd however was all balanced calm….. “We don’t clean the burnt down house away ourselves… We call in a specialised firm to do that” so my pending attack of hyperventilation subsided. What we did find was a stable large enough to house 3 or 4 horses, toilets and showers, all busted up! but fixable…, a Swiss type chalet A dilapidated mobile home and other outbuildings all in disrepair and all full of horse manure…. So the first week or so was spent mucking out. We had to bring jerry cans full of water from home because the water has been turned off at the mains in the ruin, but we managed very well. There is also an old greenhouse from about 1900. Much of the glass is broken and a wooden hut has been built around it. I hope to be able to restore it to its old use. I would like to continue writing about our adventures so I hope that I have interested readers who want to read more. 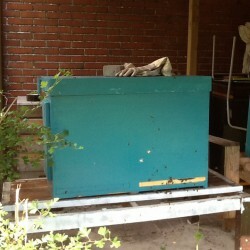 The whole idea is to create a bee garden for the native honey bees in my hives. There are old and not so healthy fruit trees that will have to be replaced. We will also plant hedgerows in the traditional style so that all bees and pollinating insects can have parties every day. It is going to be such fun, even though it is hard work we have enjoyed every minute up until now. Ruurd has already built me one table for two bee hives to stand on, he started the second one today. This means that four einraumbeute hives can stand next to each other. At this moment I have two bee folk who seem to be going healthily into winter. When the bulldozers have been to clear away the dilapidated buildings and the meadow becomes calm again we will bring the hives from their current locations to their new home. Rusty Burlew, de imker achter HoneyBeeSuite.com woonachtig in de VS, schreef een informatieve stuk over de werking van de corbiculae van bijen. Met haar toestemming heb ik dat voor onze blog vertaald. Ik hoop dat jullie het ook interessant vinden. Een honing bij heeft drie stel poten, elk paar is anders. Imkers en observerende anderen zullen wel gezien hebben dat stuifmeel in verschillende kleuren en formaten komt, maar heb je jezelf ooit afgevraagd hoe de bijen de stuifmeel pakt tot een balletje? Nou hiervoor hebben zij een schittend stuk gereedschap tot hun beschikking, het heet een stuifmeel pers. Het stuifmeel pers bestaat feitelijk uit twee platte platen die samen gescharnierd zijn. Één plaat op het distaal eind van de tibia terwijl de andere vast is aan het tegenoverliggende segment die de basitarsus heet. Hoewel de tarsus verder verdeeld is in meerdere sub-segmenten: de basitarsus en vier kleine tarsomeires. Terwijl het gewricht gebogen is, trekken de platen uit elkaar en de bij kan het stuifmeel dat ze kamt van haar lichaam in de opening duwen. Eerst, gebruikt ze alle zes poten om stuifmeel van haar lichaam te schrapen naar één plaats: de binnenkant van de achterste poot, de basitarsus. Hierna kamt ze het van de basitarsus eraf met de stijve borstels aan de buitenkant van de stuifmeel pers, een ‘pollen rake’ of in onze taal zou je het misschien een stuifmeel hark noemen! Zij maakt de linker kant schoon met de rechter poot en dan rechts met de linker poot. Dit doet ze totdat haar stuifmeel pers vol is. Wanneer zij haar poot weer strekt, sluiten de beide platen tegen het stuifmeel en dwingt het daardoor naar binnen in de stuifmeel korf of corbicula. Het is net als het persen van een tube tandpasta. Door dat te persen komt tandpasta uit het boveneind. Het klinkt averechts maar het stuifmeel korf wordt van onderen gevuld. Wat Rusty hier laat zien is het gewricht tussen de tibia en de basitarsus, want dat scharnier gewricht is het stuifmeelpers. Rusty eindigt haar uitleg hier met de notitie dat de lichaamsdelen in de foto’s waren van een dode honing bij dat ze had gevonden op haar oprit. De bij had een kaartje bij zich waarop stond: In het geval van mijn overlijden laat ik mijn lichaam na aan de wetenschap. RIP – Rust Zacht, zeggen wij dan. Eindelijk dan weer tijd om iets nieuw te schrijven voor onze website. De laatse twee dagen ben ik bezig geweest met google maps en met de hulp van twee Engelse bio-dy imkers te weten Jonathan van Beeswing en Gareth van Simplebees, om een kaart hierin te toveren. Wij, van NoordBijBees staan erin maar ook Gabe en Auke die de coordinatoren zijn voor Noord Nederland. In September wordt er een lezing gehouden door Wim van Grasstek in Meppel. Dat heb ik er ook in geplaatst. Andere web info is ook mogelijk als jullie dat ook wensen. Sinds eind juni hebben wij een geisoleerde locatie voor het onderhouden van een bevruchtings station tot ons beschikking. Wellicht volgend jaar kunnen daar bevruchtingskastjes worden geplaatst. Laten wij nu hopen op heel erg veel krachtige darren volgend voorjaar zodat de Bucky en Carnica bijen goed geweerd worden. Ik had vorig jaar mijn eigen aanpassingen aan een ontwerp voor een einraumbeute van het imker en timmerbedrijf Janisch gegeven. 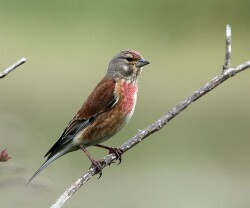 Ik wilde veel kijk mogelijkheden hebben zodat de bijen gezien konden worden door passanten in het natuurgebied zonder dat er storingen zouden optreden in temperatuur etc. Walter Janisch, de timmerman heeft nu ook mijn ontwerp in zijn catalogus. In November vorig jaar arriveerden zes “WINDOW” einraumbeute kasten in Finsterwolde. De kasten zijn gedurend de winter maanden bewaard in een lokale school waar wij af en toe bijen onderwijs geven. Daar hebben de kinderen ook een bijen hotel in een prachtige bijentuin. Uiteindelijk is het de bedoeling van ons van Noordbijbees om een gulden snede bijenkast in de schooltuin te onderhouden samen met de kinderen. Aanvankelijk waren er moeilijkheden om een volk uit een normaal Nederlandse kast hierin te krijgen. Volgens het BD leer moet je bijen de kans geven om hun instincten te volgen en ze laten zwermen. Het wonderbaarlijkst van een zwerm bijen is dat het fenomeen het natuurlijkste vorm van vermenigvuldigen is. Een zwerm honingbijen is exact afgestemd op hun toekomstige taak; dat van een goed georganiseerde kolonie. De bijen zijn op correcte leeftijd voor de taken dat ze moeten uitvoeren in hun nieuwe woning nadat ze deze zouden hebben gevonden…. Ze zijn familie van elkaar en allen verwant aan hun koningin. Zij hebben ook democratisch gekozen met haar mee te gaan. Dichterbij een natuurlijke proces kan je eigenlijk niet komen! Hun vaardigheid in het bouwen van maagdelijke was is ook adembenemend. Het grote probleem in het opstarten van een bijenkast vanuit een zwerm is dat je niet kan zeggen wanneer het zal arriveren.. Of krijg je het geluk om een zwerm aan te treffen nabij waar jij het nodig heb… In het geval van Noordbijbees moesten ze ook nog heel donkere bijen zijn. Dan nog moet je het zonder stress vangen en hopen dat ze vervogens in jouw ‘nieuwe’ kast willen blijven. Nogal een verlanglijst dus. Het is een geschenk van de natuur en je moet geluk hebben. Net zoals Ilse en Waylon hun winnende groep noemde vorig jaar tijdens het Eurovisie song festival. Ik heb ook nu twee bevolkte nieuwe gulden snede kasten in het fruitbomen hof van Louis waar ze heel veel dracht tot hun beschikking hebben. Ik denk dat onze inheemse bijen ook niet erg zwermlustig zijn. Imkers van andere rassen beweren ook dat inheemse bijen zich onrustig op de raten gedragen en dat ze steeklustig zijn. Johannes imkert zeer vele jaren met donkere bijen en ik al sinds 2013. Wij ondervinden geen van deze negatieve aspecten. Onze bijen zijn nuchter en beheeren hun vooraad zorgvuldig. Er wordt geen bovenmatig grote nest onderhouden gedurende het winter seizoen. Ze zijn ook sterk in het gezond houden van hun directe woon omgeving. Een betere bij kan een imker niet wensen, ze vinden het ook fijn, geloof ik, als je voor ze zingt……. 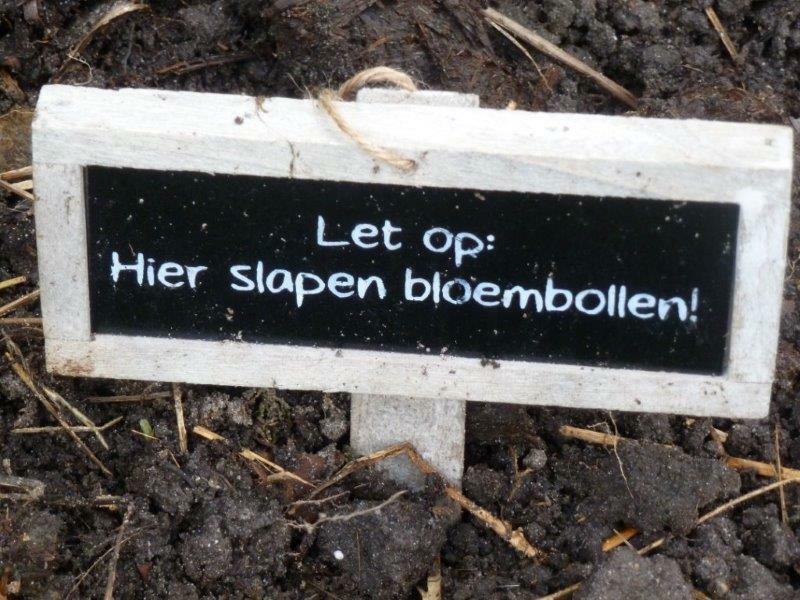 Iedere maand vinden wetenschappelijke onderzoekers nieuwe componenten, die de gezondheid van bijen waarborgen. Conventionele bijenteelt-imkers hebben dit natuurlijke weerbaarheid jaren lang niet willen erkenen. In dit geval is het de routinematige toepassing van antibiotica in suikersiroop, die waarschijnlijk bijenvolken zwakker maken. Wetenschappelijke onderzoeken waarover gepubliceerd is in september 2014 door USDA-ARS, beschrijven een nieuw ontdekte bacterië die Parasaccharibacter apium is genoemd. Tot nu toe alleen gevonden in honingbijen en hun bijenkasten. Dit bacterie lijkt de larven van honing bijen een aanzienlijk betere kans op overleven en tot poppen te ontwikkelen. In laboratoriumexperimenten ontworpen door Vanessa Corby-Harris, werden bijenlarven gevoed met P. apium-spiked-gelei of een steriele controle-gelei. De groep gevoed met P. apium had een betere overlevingskans van 20% in de eerste proef en een betere overlevingskans van 40% in het tweede proces. bacteria survived better those fed jelly that did not contain P. apium. In een recente onderzoek (1) is aangetoond dat elke component (bijen, ramen, was, propolis, honing en opgeslagen stuifmeel) zijn eigen unieke microbiome heeft. De P. apium is een voorbeeld van complexe bacteriële gemeenschappen, die in evenwicht werken om een gezonde leefomgeving te creëren voor een bijenvolk in hun kast. Wanneer een bijenvolk gestrest is of buiten zijn natuurlijke staat wordt geduwd, raakt de microbiome onevenwichtig en het bijenvolk verzwakt. Als ik denk aan het gebruik van kunststof vellen of kunststof ramen, vraag ik mijzelf af hoe de cel microbiome wordt beïnvloed door de complexe substraat van natuurlijk geproduceerde bijenwas, gemaakt van meer dan 300 verschillende onderdelen, verwisseld wordt voor polypropyleen. Voorstanders van kunststofvellen in de ramen, gebruiken dit voor het gemak en om de kosten te drukken. Zij betogen dat dit methode al jaren gebruikt wordt en dat het werkt. Er zijn veel dingen die al vele jaren worden gedaan met bijen, die ‘werken’ – suiker voeding, antibiotica, darren ruimen, kunstmatige inseminatie, miticides, koningin-vleugel knippen, zwerm-controle, dunne ommuurde kasten. Deze zijn ontworpen voor korte termijn gemak, kostenbesparing en extra productie van honing. De lange termijn kosten van deze praktijken is de achteruitgaan van de gezondheid van de bijen. Het is geen ramp dat bijenhouders kunststof gebruiken, maar er is een prijs te betalen voor al deze gemakken en de echte lange termijn kosten zijn zelden verantwoord. Bijenwas is gratis, duurzaam, biologisch afbreekbaar en ondersteunt de microbiome van de cellen en de gehele kast. De productie van was door bijen is een van de weinige processen die het milieu verbetert namate er meer wordt geproduceerd. Bijen houden ervan het te maken als zij de kans daartoe krijgen. … Dat is wat ze doen. Laat ze nu hun eigen was maken. In other recent research (1) it has been shown that each component (bees, comb, propolis, honey, and stored pollen) of the hive has its own unique microbiome. The P. apium is one such example of the complex bacterial communities that work in balance to create a healthy hive. When a hive is stressed or pushed outside its natural state, the microbiome becomes unbalanced and the hive weakens. Advocates of plastic foundation comb, used for its convenience, argue it has been used for years and works. 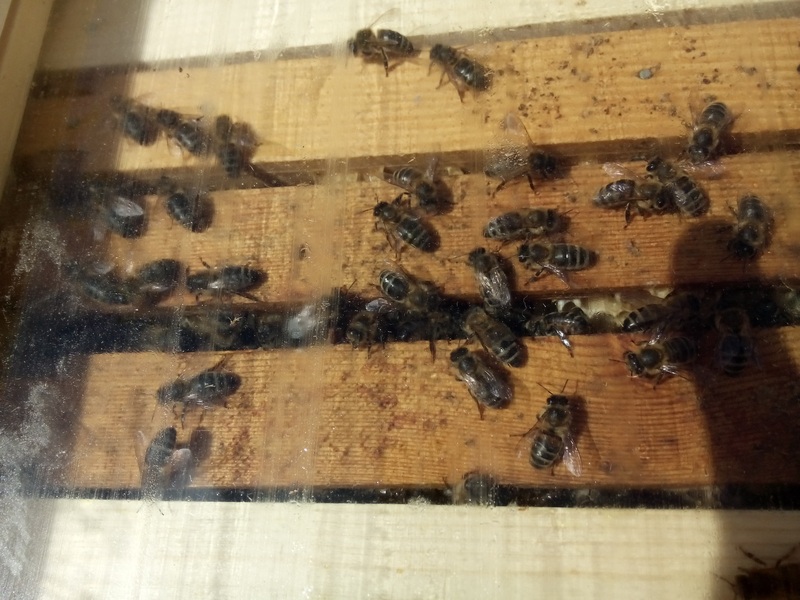 There are many things that have been done for years on bees that ‘work’ – sugar feeding, antibiotics, drone culling, artificial insemination, miticides, queen wing clipping, swarm control, thin walled hives. 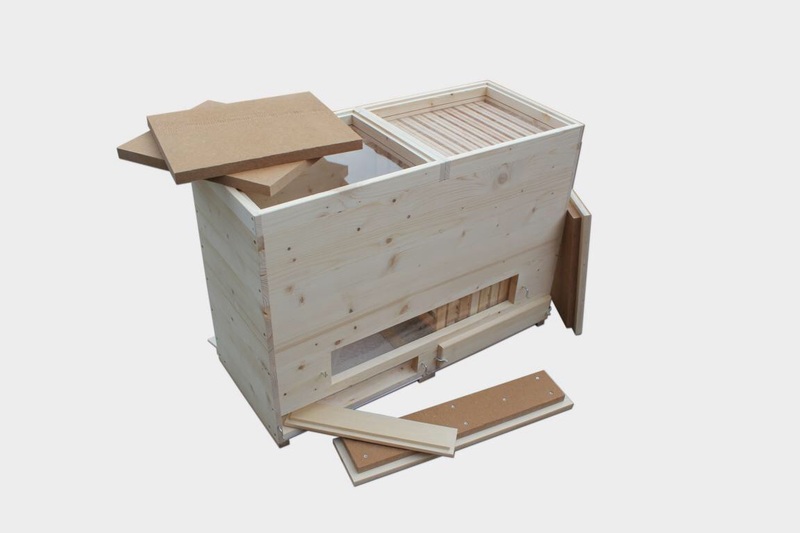 These are designed for short term convenience, cost saving and extra honey production. The long term cost of all these practices is bee health. The sky is not falling because beekeepers use plastic, however there is price to pay for all these conveniences and the true long term cost is rarely accounted. Wax is free, sustainable, biodegradable and supports the microbiome of the cell and the hive. The production of wax by bees is one of the few industries that enhances the environment the more it is produced. Bees love to make it if given the chance … it’s what they do. Let them make wax.